2016 is going to be exciting – this is the year we blow out 100 candles on our birthday cake! There’s a whole lot of preparing and celebrating to be done, but first - reflection. We bid farewell to 2015, which is always bittersweet. As a company, we believe in our crew, our community, and our craft. Here are just some of the highlights of another incredible year. We love saying we started as a one-man distribution team powered by a horse and buggy, a sleigh in the winter. Because now, our fleet is over 400 strong. We’re the 7th largest Pepsi franchise in the country. It takes a village to manage those numbers, and across our whole company, we’re nearly a 700-person team strong. That would be a few more than several horses if it were still 1916. As our customers’ needs continue to evolve, so does our need for dedicated, well-trained, and committed team members to find a solution and make the plays. It has never been about the can of pop, but always about the customer. We continue our Bernick family tradition, with 5th generation family members playing active roles in key areas of company development. Early in 2015, we unveiled a new website and a new way of marketing to current and potential customers everywhere. We rallied our crew to determine how we could make the entire food and beverage industry an easier world to navigate. We looked internally and called upon our experts, our leaders, and our passionate team members to share their voices, wisdom, and tricks of the trade with the rest of us. The result is a dynamic, user-friendly online presence that truly captures who we are as a company. Our team maintains our blog on topics ranging from Super Bowl promotions, to the evolution of craft beer; to how to successfully manage your high school’s concession stands. It’s just been so fun for us to think of better, non-traditional ways to reach our audience. And hey, you’re never too old to learn something new. We’ve all learned that. Catholic Charities - $35,000 to support the St. Cloud Children’s Home addition of indoor and outdoor fitness areas and equipment. Big Brothers Big Sisters of Central Minnesota - $25,000 towards the “On The Move” relocation and office space renovation project. Girl Scouts of Minnesota and Wisconsin Lakes and Pines - $25,000 to build a new storm shelter at Camp Roundelay. GREAT Theatre Company - $15,000 in efforts to promote their annual “Setting the Stage” capital fundraising. Friends of Sherburne National Wildlife Refuge - $10,000 towards building the Refuge’s wetland dock. Central Minnesota Council Boy Scouts - $10,000 for construction costs for the science lab at Parker Scout Camp. Alexandria Area Arts - $5,000 to support the Education Center renovation. TheShop at Brainerd/Baxter - $5,000 dedicated toward the Bicycle Recycling Project, which creates a pathway allowing youth the means to develop workplace skills and competency. The Bernick Family Foundation also granted scholarships to 10 area students who graduated in the spring. It seems nothing changes more often than the food and beverage industry. With a U.S. population of 321 million, the brands and suppliers have to keep up with the ever-evolving trends, innovations, and demands of consumers. 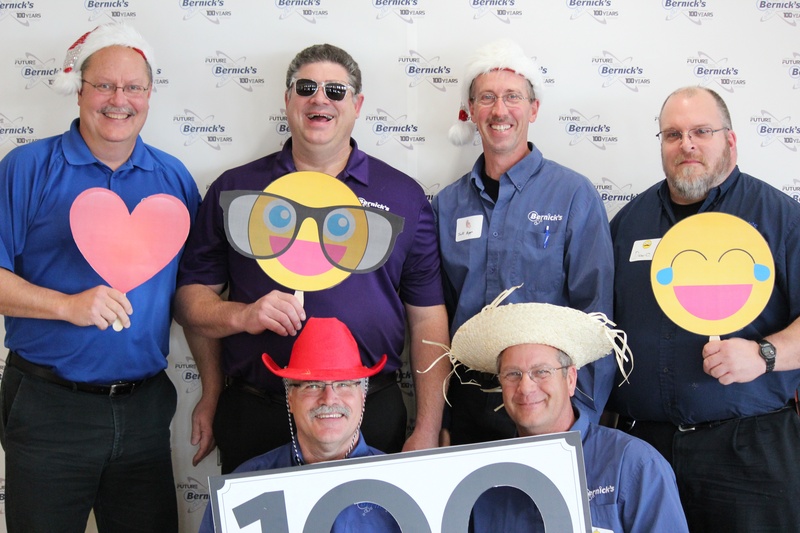 Naturally as distributors of some of the most popular and well-known brands, Bernick’s has to keep our nose to the ground, too. We love being at the forefront of emerging markets and trends. 2015 continued to prove that craft beer is here to stay. I wonder what our founding fathers would say about Scott Oeffling’s role as VP of Beer. Is there a cooler title than his? Our online craft beer portfolio keeps growing and growing, and our developers love when they have to add yet another brewery to the list of partners we serve. Some Minnesota and Wisconsin heavy hitters include Summit, 612, Schell’s, Castle Danger, Finnegans, Indeed, Thirdstreet, Insight, Leinenkugel’s, and Milwaukee Brewing Co. The rate at which independent breweries are opening across the U.S. – it’s two per day – means we’re hopeful our distribution channels grow as we continue to support local, independent breweries. We expanded our vending services to include a new model called micro markets. These stand-alone, c-store-type setups are perfect for companies who want to give their employees options. Options for fresh food, actual meal fare, and healthier choices right in the comfort and convenience of their building or campus. Our customers - including Marco - say micro markets completely benefit the organization as well as foster culture. The cost of installation is free; Bernick’s manages install, employee training, and inventory. We’re excited to continue impacting businesses with micro markets in our communities. On the product side of things as mentioned, things keep getting better and better. Craft soda, sparkling water, energy drinks, iced coffee, coconut water, probiotics, amped up chocolate … the list goes on and on! We wrote about new products our team was especially looking forward to here and here. We continue to partner with great national brands and look forward to the things they have planned in 2016. So yes, to sum it all up, 2015 was a great year. We appreciate the support and ability to be your trusted food and beverage distributor. You’ll be an important part of our next 100 years, too!